HJK Helsinki has over 2.5 goals in their last 3 matches. HJK Helsinki has over 2.5 goals in their last 3 away matches. HJK Helsinki won their last 4 matches. BATE won their last 4 matches. BATE scored in last 4 matches. Ludogorets won their last 4 matches. Ludogorets won their last 3 home matches. Ludogorets scored in last 11 home matches. Videoton scored in last 8 matches. Videoton scored in last 4 away matches. Qarabag has under 2.5 goals in their last 11 away matches. Qarabag has under 2.5 goals in their last 17 matches. Qarabag allowed opponents to score over 1.5 goals in last 8 away matches. Qarabag allowed opponents to score over 1.5 goals in last 14 matches. Sturm Graz has over 2.5 goals in their last 4 away matches. Sturm Graz has over 2.5 goals in their last 3 matches. Sturm Graz has under 2.5 goals in their last 3 matches. 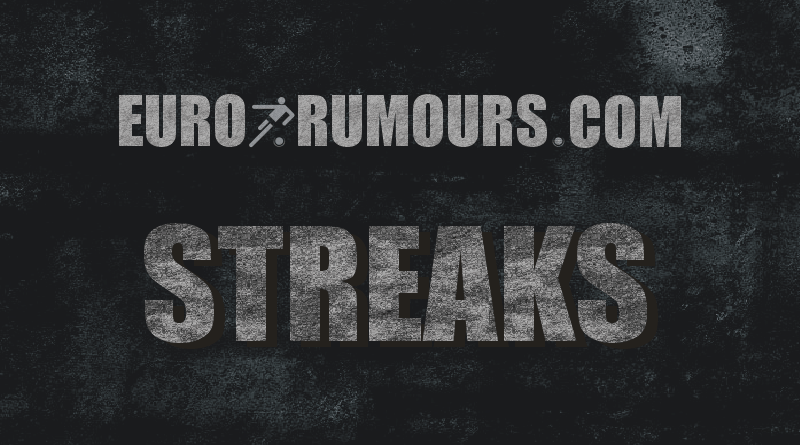 Sturm Graz won their last 5 matches. Sturm Graz won their last 7 away matches. Celtic has over 2.5 goals in their last 5 matches. Celtic has over 2.5 goals in their last 3 home matches. Celtic won their last 5 matches. Celtic won their last 3 home matches. Celtic scored in last 3 home matches. FF Jaro have failed to score in 50% of their home matches in Ikkonen (Finland). 65% of FF Jaro’s points have been earned away in Ikkonen (Finland). 29% of FF Jaro’s conceded goals occurred in the first 15 minutes in Ikkonen (Finland). AC Kajaani conceded at least one goal in each of their last 9 matches in Ikkonen (Finland). 77% of AC Kajaani’s matches had over 2.5 goals scored in Ikkonen (Finland). AC Kajaani conceded at least one goal in 100% of their away matches in Ikkonen (Finland). AC Kajaani have scored in 86% of their away matches in Ikkonen (Finland). AC Kajaani have scored 65% of their goals away in Ikkonen (Finland). AC Kajaani have scored in each of their last 5 away matches in Ikkonen (Finland). AC Kajaani have conceded 2 goals or more in each of their last 4 away matches in Ikkonen (Finland). Fram Reykjavik conceded at least one goal in each of their last 9 matches in 1. Deild (Iceland). 83% of Fram Reykjavik’s matches had over 2.5 goals scored in 1. Deild (Iceland). 75% of Throttur R.’s matches had over 2.5 goals scored in 1. Deild (Iceland). Throttur R. have scored in each of their last 6 away matches in 1. Deild (Iceland). Cerezo Osaka conceded at least one goal in 88% of their home matches in J1 League (Japan). Cerezo Osaka have scored in 100% of their home matches in J1 League (Japan). 67% of Cerezo Osaka’s points have been earned at home in J1 League (Japan). Cerezo Osaka have scored 71% of their goals at home in J1 League (Japan). Cerezo Osaka have been undefeated in their last 8 home matches in J1 League (Japan). Kashima have scored in 71% of their away matches in J1 League (Japan). 77% of Kashima’s points have been earned at home in J1 League (Japan). Kashima have conceded 2 goals or more in each of their last 3 matches in J1 League (Japan). Kashima have conceded 2 goals or more in each of their last 5 away matches in J1 League (Japan). 96% of Yobe Stars’s points have been earned at home in NPFL (Nigeria). 90% of Yobe Stars’s conceded goals were conceded away in NPFL (Nigeria). Nasarawa United conceded at least one goal in 100% of their away matches in NPFL (Nigeria). 100% of Nasarawa United’s points have been earned at home in NPFL (Nigeria). Nasarawa United have scored 85% of their goals at home in NPFL (Nigeria). Nasarawa United have lost 100% of their away matches in NPFL (Nigeria). Nasarawa United have lost their last 12 away matches in NPFL (Nigeria). Nasarawa United have failed to win in their last 12 away matches in NPFL (Nigeria). Nasarawa United conceded at least one goal in each of their last 12 away matches in NPFL (Nigeria). 67% of Wikki Tourist’s matches had under 2.5 goals in NPFL (Nigeria). Wikki Tourist have scored in 92% of their home matches in NPFL (Nigeria). 97% of Wikki Tourist’s points have been earned at home in NPFL (Nigeria). Wikki Tourist have scored 81% of their goals at home in NPFL (Nigeria). 85% of Wikki Tourist’s conceded goals were conceded away in NPFL (Nigeria). Wikki Tourist have been undefeated in their last 12 home matches in NPFL (Nigeria). Akwa United have won their last 4 matches in NPFL (Nigeria). 75% of Akwa United’s matches had under 2.5 goals in NPFL (Nigeria). 78% of Akwa United’s points have been earned at home in NPFL (Nigeria). Akwa United have scored 85% of their goals at home in NPFL (Nigeria). Sunshine Stars have scored in 92% of their home matches in NPFL (Nigeria). 90% of Sunshine Stars’s points have been earned at home in NPFL (Nigeria). Sunshine Stars have scored 86% of their goals at home in NPFL (Nigeria). Sunshine Stars have been undefeated in their last 12 home matches in NPFL (Nigeria). Plateau United conceded at least one goal in each of their last 8 matches in NPFL (Nigeria). 71% of Plateau United’s matches had under 2.5 goals in NPFL (Nigeria). Plateau United conceded at least one goal in 92% of their away matches in NPFL (Nigeria). 86% of Plateau United’s points have been earned at home in NPFL (Nigeria). Plateau United have scored 89% of their goals at home in NPFL (Nigeria). Plateau United have lost 75% of their away matches in NPFL (Nigeria). Plateau United have failed to win in their last 11 away matches in NPFL (Nigeria). Plateau United conceded at least one goal in each of their last 11 away matches in NPFL (Nigeria).